On Friday, Jan. 25, University of California, Santa Barbara students protested and picketed outside of 781 Embarcadero del Norte in Isla Vista in response to the recent evictions of IV families from the apartment building by the manager, Matthew Platler. 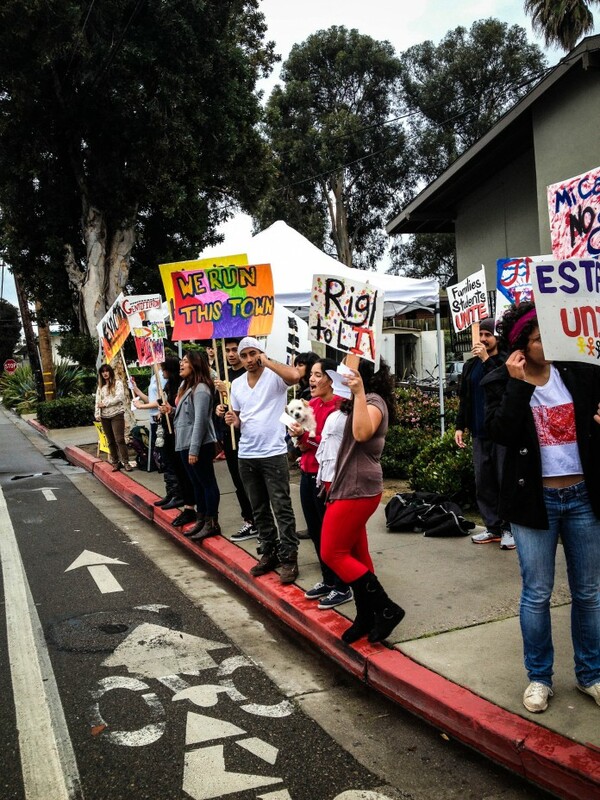 The protest, entitled “Picketing to Protect” and organized by Isla Vista Tenants Union (IVTU), lasted about three hours and caught the attention of many passersby and drivers, who honked their support for the protesters. Since the past summer, 16 families have been evicted from the apartment building without receiving adequate notice, in order to make the units available to rent out to students at higher prices. Holding a picket sign with the words “Right To Live” painted on it, third-year global studies major Norma Orozco, protested at the event. “I want to get out the word and let the landowner, as well as the students, know that we are not going to be silenced. It’s an unjust eviction of families who live here and who are a part of this community,” said Orozco. Platler Capital Management purchased the apartment complex in April, and soon after, eviction notices were sent out. The company also began construction in the building, which upset many residents due to the lack of notice and the unlivable conditions they were subject to. Tenants then approached IVTU for assistance. IVTU started working with the tenants and advocating on their behalf. IV Community Advisor Hilary Kleger and IVTU are currently working to help get the tenants compensation through Ordinance 4444, which increases rights for renters who are evicted through no fault of their own and may allow them to receive compensation. Lorena Garcia, one of the people who were evicted from the building, also showed up at the protest and shared her experience. IVTU and other protesters stressed the fact that they believe this is happening due to the likelihood that the landlord could get students to pay higher rent. Therefore, IVTU wants students to be more aware of what is happening in their own neighborhood so that they can make informed decisions. Currently, IVTU is working on a complaint to the Department of Fair Employment and Housing in regard to the evictions. You can sign a petition here to urge Platler to compensate the evicted tenants: http://www.change.org/petitions/petition-platler-to-pay.